This is a crunchy and fun version of the classic campfire favorite. 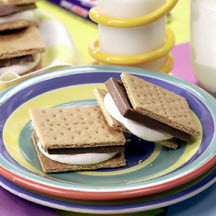 Give your S'mores some real CRUNCH! Place 2 graham cracker squares on microwave-safe plate. Top each square with 1 marshmallow. Microwave on HIGH (100%) power for 10 to 15 seconds or until marshmallows expand. Top each marshmallow with 1 candy bar square and remaining graham cracker square.